Thread: Saddle gone dark when oiled with conditioner, is there any way of getting these dark patches lighter. 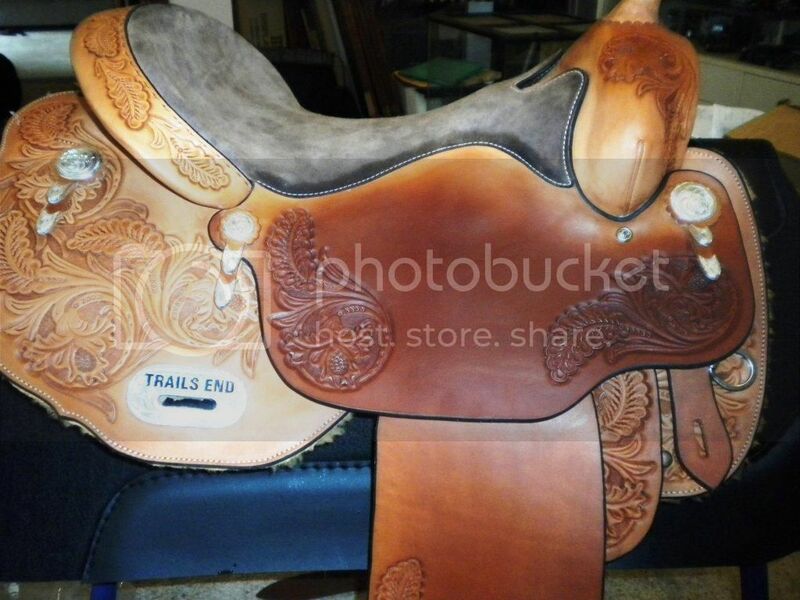 I have bought a new western saddle $3,600 Australian dollar. Light colored leather and have not even ridden in it yet. I am very angry with myself because, when I oiled it with "Effax" Leder-Balsam (nothing wrong with the product). I now have two large very dark patches on a light the seat jockeys (I have attached a picture of a saddle to show you where) not my saddle. Can you please suggest what to do? And if it's using Leather Doctor’s products, how can I get them please. As you can see from the saddle skirt, it was a lot lighter. I hope you can help, as I am not sure how light I will be able to get the saddle, where it has gone dark. Looking forward to your reply, as I would like to do something about this ASAP. Product for degreasing is found in this Kit V3.dr. The main product is Degreaser-2.2 with Rinse-3.0 as a follow up to remove the suspended oil/grease stain from the surface. As the surface grease is removed, the remaining penetrated grease will continue to takes its place until the grease stain is totally exhausted. This process is repeated, depending on how deep the grease has penetrated. The result is only visible when the leather dries as it brings the soiling particulates to the surface to be erase with the leather Eraser-4. This process may be repeated with a few drying and erasing process until satisfaction. We should see progressive result before we move on to the next complimentary phases. A test is recommend on the red circled areas to realize the full potential of degreasing before actual doing the entire panel. 1] Shake-up the Degreaser-2.2 until it gels. 2] Transfer to the horsehair Brush-1 and spread with combine agitation to the test area. 3] When the grease is emulsified it will turn from clear to milky and this suspended is to be extracted with a terry white towel. 4] Spray Rinse-3.0 and brush agitate with simultaneous towel extraction. 5] Repeat towel extraction with blotting action rather than rubbing to reduce friction rubs. 6] As the water contents evaporates that also carry soiling particulates, repeat blotting will transfer the soiling to the towel instead of depositing on to the leather surface. 7] Leave the leather for slow natural drying to allow effective wicking effect. 8] When crispy dry erase wick up soiling particulates with leather Eraser-4. 9] Inspect for satisfaction, otherwise repeat the above process; bear in mind that penetrated soiling can only be removed when it reaches the leather surface, either by towel extraction when wet or eraser when crispy dry. 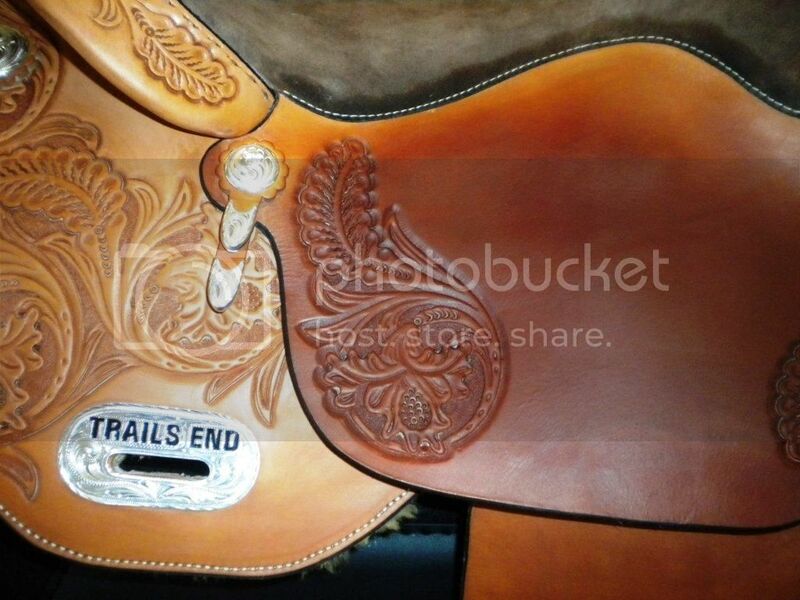 Hi Roger, here are some pics of my saddle sorry for the delay. The lighter parts on my saddle are where I had to rub out some scratches. I have been using rinse 3.0 and Hydrator 3.3. The leather of my saddle is “Herman Oak” western saddle. I was going to apply Fatliquor 5.0 it says work through the reverse side, does this mean you can only apply it to the underside if showing, or do you only put it on the top facing leather, or can you apply it to top and underside, I am a little confused? CAN YOU PLEASE ADVISE ME OF WHAT TO DO PLEASE, as a would like to do this ASAP. Can you please tell me again, what I would require to look after my western saddle from start to finish please. I think you would call it vegetable tanned leather. My saddle was the one where I had the problem of putting too much leather conditioner on it and it went dark in spots. Last time I go the degreaser, but I don’t think I need this anymore. I also got the cleaner 3.8 , hydrator 3.3, Acidifier 2.0, Protection D+ and Fatiquor 5.0. I lost my notes from last time you told me how to use these products, can you please tell me again. Such as cleaning it to finishing it. I was reading on your web site, that you have a Micro Top-545 Gloss, would this be good to put a shiny finish on my saddle for a final coat as I would like it to look shiny? Also I noticed you had dye’s to highlight leather carving, would the dark brown be good for my saddle or is this product only for new saddles? Looking foward to hearing from you again. Hi Roger, here are some pics of my saddle sorry for the delay. >>> The lighter parts on my saddle are where I had to rub out some scratches. To improve the appearance Hydrator-3.3 will help when dwell up to 72hrs with control evaporation. This saturated dwelling will help moves and redistribute the leather constituents for a better appearance. Thereafter Fatliquor-5.0 application when water content evaporates from the Hydrator-3.3 and continue as each drying of the fatliquor water content as well. When the leather is drying more fatliquor is applied until the leather is saturated before drying. The fatliquor content of fat and oil is readable from a moisture meter and up to 14% would make the leather very supple. Note: as there are compressed craving in the design keep watch when hydrating as some loose compressing design may become less prominent. >>> I have been using rinse 3.0 and Hydrator 3.3. Rinse-3.0 is used as a standalone or follows up after Degreaser-2.2 or Clean-3.8. Hydrator-3.3 is meant to hydrate the thickness of the leather and is multi functional depending on objective in mind. Example it is used to move the leather constituents in this case the tanning agent to the lighter appearance and help even out the appearance. To do so the entire leather has to be saturated and the moisture content especially the coloring allows to move freely in order to achieve the desired result. It helps to relax the leather as well and since the design may be compressed or stamp rather than carved the compressed motif may becomes less prominent to take caution on. >>> The leather of my saddle is “Herman Oak” western saddle. Are unfinished or naked leather and should be treated accordingly to the Leather Problem Solving Guide for Vegetable-tanned leathers. >>> I was going to apply Fatliquor 5.0 it says work through the reverse side, does this mean you can only apply it to the underside if showing, or do you only put it on the top facing leather, or can you apply it to top and underside, I am a little confused? CAN YOU PLEASE ADVISE ME OF WHAT TO DO PLEASE, as a would like to do this ASAP. Fatliquor-5.0 is meant to go into the thickness of the leather to hydrogen bond with its inter-fibrillary to impart suppleness. In order to do it more effectively the inter-fibrillary structure is best preconditioned with Hydrator-3.3 separating and opening up the stick together fiber for the ease of distributing the fatliquor within the leather structure. Take note that any compress motifs may become less prominent when over relaxed. >>> Can you please tell me again, what I would require to look after my western saddle from start to finish please. 1 – Soiling is removed according to Guide. 2 – Leather Rejuvenating is by Hydrator-3.3 > Fatliquor-5.0 > Hydrator-3.3 system. >>> I think you would call it vegetable tanned leather. My saddle was the one where I had the problem of putting too much leather conditioner on it and it went dark in spots. Any oil conditioner will darken the leather. Fatliquor-5.0 will season and mellow the leather with color intensity enriched appearance (will reduce the lighten from scrubbing). >>> Last time I go the Degreaser-2.2, but I don’t think I need this anymore. I also got the Clean-3.8, Hydrator-3.3, Acidifier-2.0, Protector-D+ and Fatiquor-5.0. I lost my notes from last time you told me how to use these products, can you please tell me again. Such as cleaning it to finishing it. Leather Doctor® Degreaser-2.2 is a pH 2.2 leather-safe waterbased degreaser with dye bleeding control. It is design for degreasing leather of penetrated oil, grease and sweat stains from skin, and hair contact, especially the headrest and armrest of upholstery, collar and cuffs of garment, handles of bag including steering wheel. It works best in conjunction with Rinse-3.0 to rinse emulsified soiling or Acidifier-2.0 for rinsing, bleeding control and pH balancing sweaty contamination from leather denaturing into rawhide. This universal leather degreaser is for all leather types including the common pigmented, aniline, vachetta, nubuck and suede. 1. Identify leather types and dry soil removal prior to application. 2. Shake until cloudy gel, apply and agitate with leather, nubuck or suede brush and or leather Eraser-4. 3. Allow dwelling 5 to 30 minutes or before it dries for a complete soiling suspension to occur. 4. Extract suspended soiling with dry towel. 5. Then remove remaining residue with Rinse-3.0 to a squeaky-clean, for reduce bleeding use Acidifier-2.0 instead. Clean-3.8 is categorized as Leather Cleaner, Aniline Cleaner, Semi-Aniline Cleaner, Nubuck Cleaner, Suede Cleaner, Vachetta Cleaner, Saddlery Cleaner and Vegetable-Tanned Cleaner. Design with a pH value of 3.8 is an all-purpose mild leather-safe anionic universal cleaner for all leather types without the potential side effects like rings and browning on sensitive leather or suede. It is particularly effective in emulsifying oily soils and in suspending particulates. It works by penetrating, lubricating and suspending soiling safely and effectively through gentle chemical reaction working in perfect harmony with all leather constituents that include the tanning agent, preservative, dyestuff and especially the fatliquor for a leather-safe cleaning experience. In a holistic cleaning system it is highly recommended to follow through with Rinse-3.0 to a healthy squeak thus prevents or ceases potential remaining residue from overworking. Use Brush-1 (horsehair) for all smooth leathers. Use Brush-2 (nylon) for nubuck. Use Brush-3 (brass) for suede (always use this sharp brass brush at a slant angle to avoid scratches to fine suede). Use Eraser-4 for all smooth leathers, nubuck and kid/lamb suede. 1 Identify, inspect, test and dry soil removal prior to application. 2 Shake well, spray and agitate with appropriate brush. 3 Dwell 10 to 30 minutes or before it dries for complete soil deflocculation to occur. 4 Extract suspended soiling – use dry absorbent towel. 1 Rinse to a healthy squeaky clean until towel shows clean – use Rinse-3.0. For stubborn soiling, use either Prep-7.7 for pigmented leathers or Prep-4.4 for all other aniline leathers including nubuck and suede. 1 To reduce stickiness when necessary – use Acidifier-2.0. 2 To hydrate stiff leathers – use Hydrator-3.3. 3 To soften and strengthen leather – use Fatliquor-5.0. 4 To impart a non-stick rub-resistant protection – use scented Protector-B+, D+, S+, W+ or scentless B, D, S or W.
Leather Doctor® Acidifier-2.0 is a waterbased pH 2.0 leather acidifier designs for controlling dye bleeding in conjunction with Degreaser-2.2 in extreme prolong oil, grease and sweat decontamination system. As a standalone, it is for pH balancing alkaline overexposure that manifest as marks, streaks, brightness and tackiness. This universal acidifier is for all leather types including pigmented, aniline, vachetta, nubuck, suede, hair-on-hide and woolskin leather types. 1 Spray direct sufficiently and agitate with appropriate leather horsehair brush-1, nubuck nylon brush-2 or suede brass brush-3. 2 Towel extract suspended soiling until it shows clean. 2 Dwell 10 to 30 minutes depending on exposure severity. 3 Extract residues with dry absorbent towel. Leather Doctor® Hydrator-3.3 is a waterbased pH 3.3 leather-safe hydrator. It is a fatliquor preconditioner with multi functional abilities. Surface application is primary to check for even surface tension free of blotchiness prior to fatliquor replenishing. Structural application will require saturating to an optimum level with moisture oozing out when gently pressed between thumb and fingers. a) to check for surface tension for an even appearance free from blotchiness prior to fatliquor replenishing. b) To plumps, relaxes and separates crushed, shrunk and stick together fibrils for manipulating away-unwanted creases and wrinkles. c) To rectify alkaline overexposure areas by facilitating colloidal water movement to redistribute the leather constituents from surrounding areas. d) To activate the dormant dyestuff within the leather structure for color refreshing. e) To facilitates colloidal water movement within the inter-fibrillary spaces for wicking foreign soiling particulates to resurface. f) To stabilize, pH balance and charge the protein fiber below its iso-electric point (pI) ionic positive to hydrogen bond with the ionic negative fatliquor more effectively. This universal Hydrator-3.3 is for all leather types including pigmented, aniline, vachetta, nubuck, suede, hair-on-hide and woolskin. A1. Spray Hydrator-3.3 evenly and wipe with lint free towel to free of surface tension for an even appearance prior to fatliquor replenishing. B1. Saturate the thickness of the leather to an optimum level with moistures oozing out when gently pressed between thumb and fingers. B2. Cover up with plastic wrapping to control evaporation and let it dwell for softness. B3. Manipulate by stretching and cross flexing to relax the leather prior to fatliquor replenishing. C1. Saturate the thickness of the leather to an optimum level with moistures oozing out when gently pressed between thumb and fingers. C2. Cover up with plastic wrapping to control evaporation and let it dwell for redistributing of the leather constituents from surrounding area. C3. Observe for appearance and test by finger for tactile squeaky feel prior to fatliquor replenishing. D1. Saturate the thickness of the leather to an optimum level with moistures oozing out when gently pressed between thumb and fingers. D2. Cover up with plastic wrapping to control evaporation and let it dwell up to 72 hours for excess dyestuff to resurface. D3. Remove plastic cover and let it natural dry to observe color improvement prior to fatliquor replenishing. E1. Saturate the thickness of the leather to an optimum level with moistures oozing out when gently pressed between thumb and fingers. E2. Cover up with plastic wrapping to control evaporation and let it dwell up to 72 hours for foreign soiling particulates to resurface. E3. Remove plastic wrapping, replace with tissue paper without airspace to trap stains as it dries instead of remaining on the surface. E4. Peel tissue paper when crispy dry and erase with Eraser-4 or Eraser-5 for suede accordingly prior to fatliquor replenishing. Leather Doctor® Fatliquor-5.0, a micro emulsion of fat, oil and water is an anionic charged pH 5.0 fatliquor for rejuvenating all leather types. It relaxes coarse breaks, creases and wrinkles enhance suppleness and prevent cracking. It softens the leather with stretchability, compressibility and flexibility, while enhancing its rip tensile strength greatly. It is for replenishing the original fat and oil that diminishes thru sun-bleaching, ageing, heat and alkaline overexposure or cleaning. On application, the water-encased molecule breaks free when hydrogen bond attraction takes place between the fat and oil with the protein fiber. The excess free water content wicks out leaving a breathing space behind for leather natural transpiration. The fat plumps the leather with fullness from easily collapsing into creases and wrinkles during stress or flex, while the oil lubricates the fibers so that they slide over one another smoothly like millions of inter-connecting hinges. Thus helps to keep leather at its optimum physical performance and prevent premature ageing. This universal Fatliquor-5.0 is for all leather types including pigmented, aniline, vachetta, nubuck, suede, hair-on-hide and woolskin. The quantities of fatliquor (fat and oil) contents retained in the leather after an universal tannery fatliquoring process may varies up to 14% depending on the leather types and it usage. This percentage drops as the fat and oil content diminishes or leaches through ageing, water, heat or chemical overexposure. If the weight of the leather in question is 100gm and fatliquor (fat and oil) content meter reading is less than 1%. By applying 80gm of Fatliquor-5.0 to it will deliver an end result incremental of 13.3% fatliquor when dry as the 66.6% water contents evaporates. In the leather rejuvenating Hydrator-3.3 > Fatliquor-5.0 > Hydrator-3.3 system, Hydrator-3.3 plays an important role by relaxing, opening up the inter-fibrillary spaces, facilitating and redistributing colloidal water movement, protonating and doing all the pre-conditioning work prior to fatliquoring including cleaning up any excess surface remnants to have a sticky-free surface. In practice the ratio for Hydrator-3.3 is 2 to 1 of Fatliquor-5.0. It works out to be approximately 160gm of Hydrator-3.3 plus 80gm of Fatliquor-5.0 to replenish a 100gm dry leather from less than 1% back to the original tannery up to 14% fatliquor content. 1 Apply Fatliquor-5.0 and redistribute with foam brush until saturation. 2 Repeat application each time water contents evaporate until fully saturated. 3 Drive remaining surface remnants free of milky fat and oil until it turns clear with Hydrator-3.3. 4 Allow natural drying for extra softness. 1 When crispy dry, prior surface contaminations/damages may darkens as soiling particulates resurface. Leather Doctor® Protector-D+ is design for aniline and nubuck wax pull-up leathers, including bicast, vachetta and steering wheel. This is a non-film forming, non-stick, rub-resistant protector that enhances a draggy-feel with a classic leather scent. It imparts a non-stick, breathable barrier essentially to shield the detrimental effects of sticky soiling. Its natural draggy-feel protection increases the leather resistance to wet and dry rubs, thus reduce stretch, scuff and abrasion. The friction drag produces an unforgettable familiar sound sweet to the ears. It is also use as a scuff repairer, filling and concealing surface scuffs to improve appearance. 1 Identify, inspect and dry soil removal before application. 2 Shake very well, mist spray and spread evenly with a foam brush. 3 For a quick and easy care, spray and wipe with absorbent towel. 4 Groom nubuck with Nubuck Brush-2 for a “finger writing effect”. >>> I was reading on your web site, that you have a Micro Top-545 Gloss, would this be good to put a shiny finish on my saddle for a final coat as I would like it to look shiny? Wax Effect-8.6 is a better choice as it forms a discontinuous film that allows the leather natural transpiration to take place to match this naked or unfinished leather. The shine is activated with a heat blower or hot hair dryer after fine wax crystal forms or coats the surface. 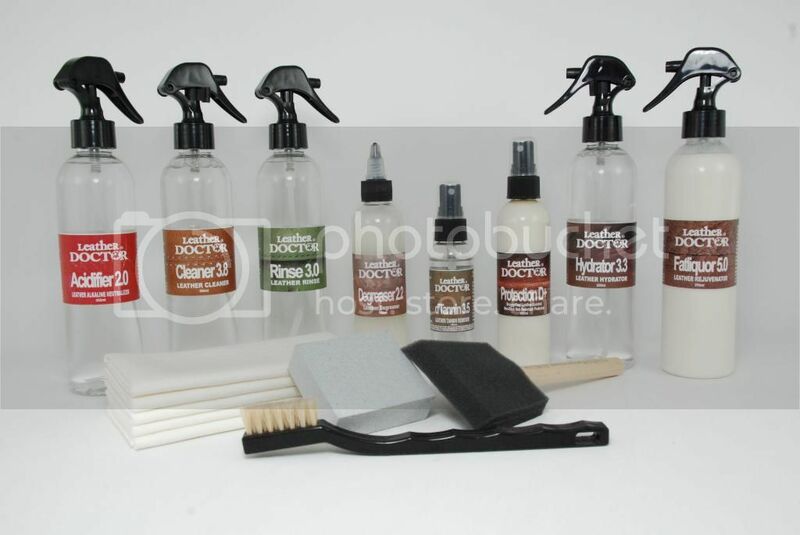 Leather Doctor® WaxEffect-8.6 is design for aniline and nubuck wax pull-up leather types. This is a pH 8.6 waterbased emulsion for rejuvenating wax pull-up effect diminished through usage, ageing or cleaning. 1 Warm up, shake well, spread and saturate with foam brush into the leather structure evenly. 2 Allow a minimum 6 hours natural drying time or until cloudy residual wax shows on the surface. 3 Activate cloudy residual wax with a heat blower or hair dryer to bring out the natural waxy sheen. 4 Create pull-up effect by kneading, flexing or creasing it. 5 Impart a draggy-feel non-stick rub-resistant protection with a classic leather scent - use Protector-D+. 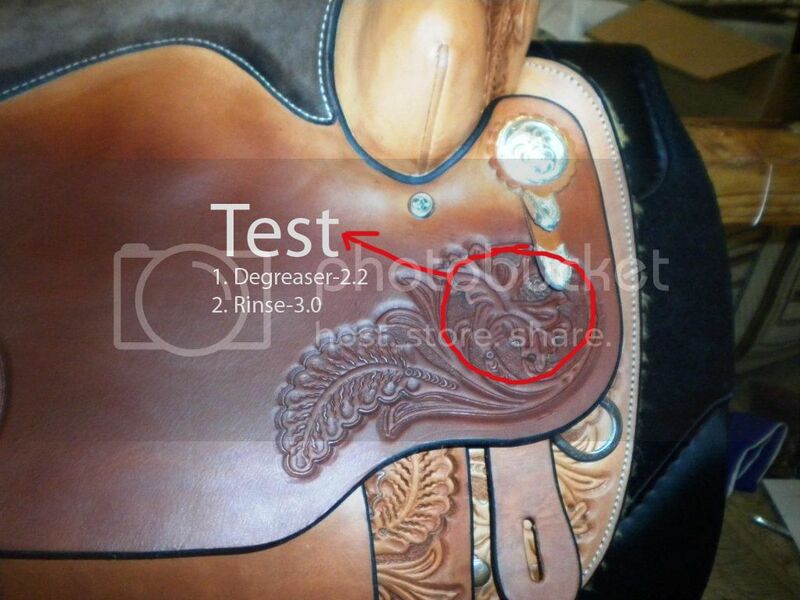 >>> Also I noticed you had dye’s to highlight leather carving, would the dark brown be good for my saddle or is this product only for new saddles? For used leather color is by “coating” rather than by “staining”. Product used is Aniline-76 and the leather becomes a coated finishes that does not breathe. It is too early to resort to dyeing and I do not recommend you right now. We will see how the above have improved the appearance before doing so. would d'tannin 3.5 be any benefit for my saddle? d'Tannnin-3.5 will lighten up the sun tan of the leather or any darker discolouration even from rain water but Vachetta-2.8 have extra ingredient to remove grease and mild tarnish stain as well. Vachetta-2.8 is more appropriate especially you still have the some unwanted darkening oil residue as well to even out although Degreaser-2.2 will do a better job. Vachetta-2.8 is a specialty leather browning treatment design especially for unfinished veg-tan leathers popularly known for handbag as Vachetta. This is a waterbased pH 2.8 product, which is particularly effective in emulsifying oily soiling, lightening suntan, tarnish and liquid browning staining effect. Use in conjunction thereafter with Hydrator-3.3 to relax, Fatliquor-5.0 to soften thus prevents cracking and Protector-D to seal, conceal and allow leather transpiration in a holistic care system. When vachetta leather color turns to dark in extreme cases especially to constant body contact areas like handles, it will require Degreaser-2.2 follows with Acidifier-2.0 found in Kit V4 to decontaminate the oil, grease and sweat as the first phase prior to browning treatment, leather rejuvenation and protection. 1. Remove dry soil prior to product application. 2. Shake well, spray and saturate with horsehair brushing for an even appearance and towel extract until it shows clean. 3. Option is to use a saturate cotton swab and clean until the cotton swab shows clean or use a terry towel. 4. Let natural drying and inspect result, repeat as necessary. 1. Saturate with Hydrator-3.3 to soften and for an even appearance. 1. Saturate with Fatliquor-5.0 and as water contents evaporate, repeat application. 1. Apply Protector-D for an even appearance.